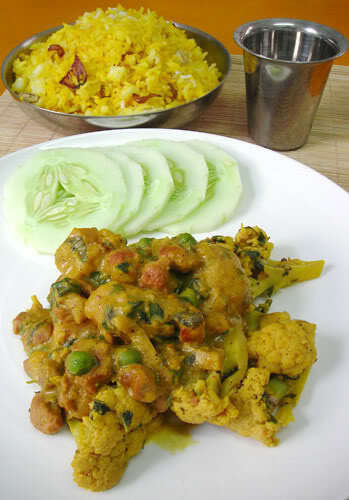 A highly aromatic kalia soya chunks curry with cauliflower. 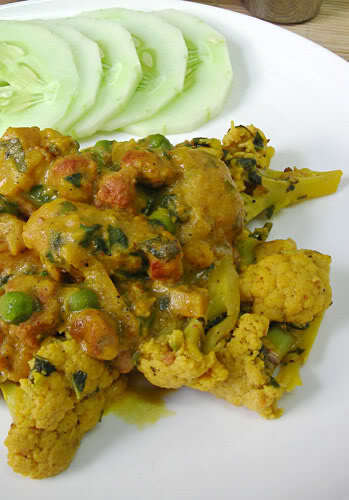 This vegetable kalia recipe makes use of coconut milk for a rich creamy curry gravy. Vegan cauliflower curry. Tonight for dinner I had Soya Chunk Curry with Cauliflower in Kalia gravy! This lovely Indian dish is traditionally a Kashmiri dish prepared with meat or fish and yogurt. Of course my recipe is the veganised version that I made with soy chunks, cauliflower and coconut milk. 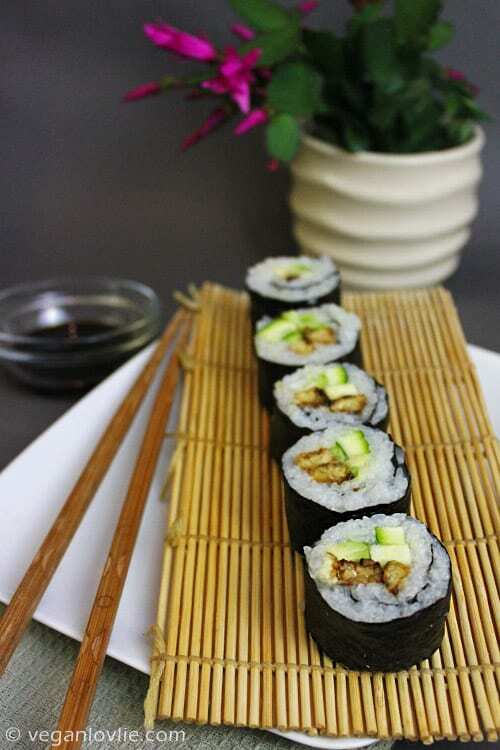 This can also be made with red kidney beans if you are allergic to soy or don’t have any soy chunks. By the way, did I mention that my intolerance to soy has practically vanished? I am still crossing fingers on this but I am enjoying more and more soy in my food now with no problems so far! 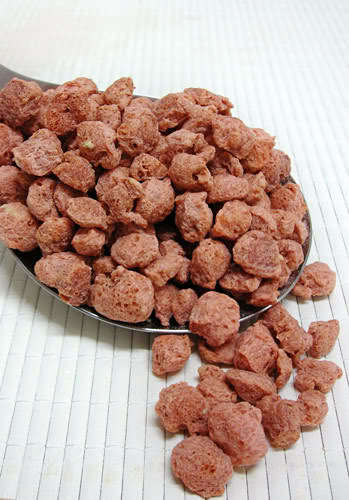 If you’ve never had soya chunks before, also known as TVP or Textured Vegetable Protein, you might want to try them. They are very easily available over here in Mauritius. But in London, I could only find them in health stores. They are dehydrated chunks made out of soy flour and come in various sizes and colours; you can get them in a minced version as well. The ones I’m using are about one cubic centimeter in size and somewhat orangey in colour. All you need to do is rehydrate them before cooking. You can either soak them for at least 4 hours prior to cooking or boil them for about 15 minutes (in which case you don’t need to soak). If you are really out of time, just microwave them from dry in a big bowl of water for about 2-3 minutes or until soft and spongy. 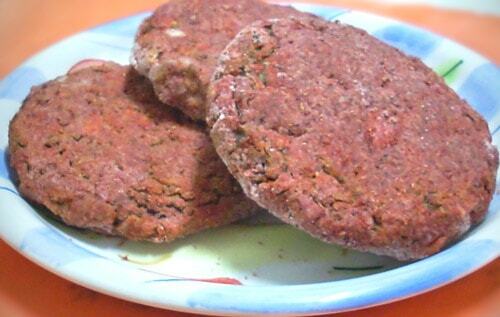 You can use them in various dishes like stir fries, curries, stews and I sometimes make patties or meatless balls with the minced ones. I’ve even made this Vegan Tuna Mayonnaise with TVP and it’s epic! Heat 1 tablespoon of oil in a deep pan. Add soy chunks and potatoes with curcuma. In the same pan, heat 1 tablespoon oil. Add onions and stir fry for about 2 minutes. Add ginger, garlic, coconut milk, cumin and garam masala. Let simmer on medium heat until liquid is reduced to about half. Add half of the coriander and mint. Add water and simmer for about 2-3 minutes. Add potatoes, soy chunks and peas. Add more water if required to create enough sauce for the potatoes to cook without sticking to the pan. When potatoes are almost cooked, add cauliflower. (Make sure to add the cauliflower at the very end, otherwise they will cook too much). Add the rest of the coriander and mint. Cover and simmer until all is well cooked and liquid has reduced and thicken. You can have this with plain rice or Indian bread or yellow rice like I did. I served with soya chunk and cauliflower curry with this beautiful fragrant yellow rice. Boil the rice with 4 – 5 cardamon pods. Drain and set aside to cool. Heat margarine in a large pan. Add onions. Fry until golden, stirring occasionally. Add half of the completely cooled rice to the pan. Stir and mix well. Add the curcuma or yellow food colour to the rest. Then add this to the pan. Stir and let fry for a few more minutes. Remove from heat and don’t cover immediately, if you are not eating this straight away, or the rice might become a bit too mushy. A highly aromatic vegan curry recipe with soya chunks, also known as TVP – Textured Vegetable Protein, and cauliflower. 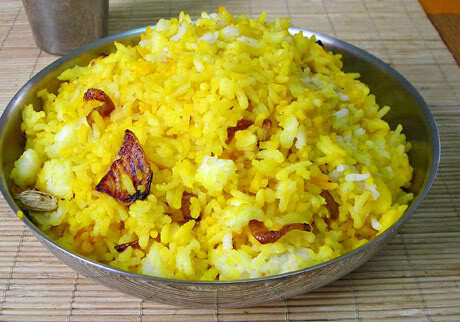 A beautiful yellow rice recipe fragrant with warming spices and caramelised onions. Boil the rice with 4 – 5 cardamon pods, until cooked but still a little firm, not mushy. (about 15 minutes depending on type of rice). Drain and set aside to cool. Stir and let fry for a few more minutes. Remove from heat and don’t cover immediately if you are not eating this straight away, or the rice might become a bit too mushy. Love this Kalia Soya Chunk & Cauliflower Curry with Aromatic Yellow Rice? Don’t forget to pin it for later. Previous Post: « Muffins, pancakes and chutney! MMM! Looks delish! I haven’t had "real" Indian food and I dieing to make it myself to try! I love Indian food! It all looks delish! Wow! Your photos look great…i could practically smell the rice. Impressive stuff. Thanks for the great recipe, I love Indian, but no matter what I do, I feel that I always end up with the same dish. But maybe if I actually use a recipe (YOURS!) I might end up with something other than curry flavoured coconut milk! <BR/><BR/>Thanks. And that’s great about your soy intolerance. this look absolutely delicious! i want to reach over and gobble it all up! thanks for sharing another great recipe!<BR/><BR/>and that’s good news on the soy, too! yay! Absolutely beautiful pictures (and food) today! Thanks for sharing the recipe – I just made this and it was wonderful! I added spinach and salt, and skipped the coconut milk. Instead, I cooked the dish with coconut cream, and right before serving, added some soy yoghurt, a tablespoon of margarine, and some lemon juice. <BR/><BR/>So delicious, I already look forward to my leftover lunch tomorrow! Lovlie – thank YOU once again, mmmm this is so yummy! We can buy a nice plain soy yoghurt in Finland, but I usually add it after cooking – the consistence gets a little funny when cooked sometimes.<BR/><BR/>My lunch is only 10 minutes away – yay! 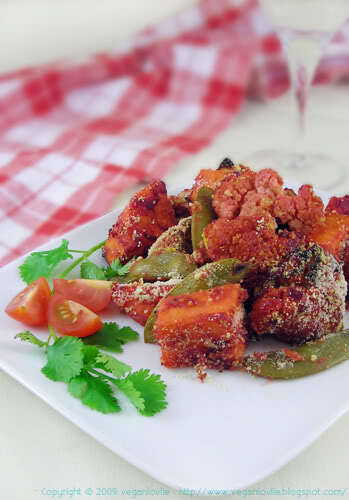 ann: I’m glad you’ve found a use for your soy chunks!<BR/><BR/>ashish: Glad that you tried this recipe and liked it! With the potatoes, maybe try using a non-stick pan and cover. It might help. We eat very savory at home, but this is amazing! We don&#39;t believe that vegan cooking has to be tastless…<br />Thanks for sharing. My family hails from Kashmir and, needless to add, I love the cuisine.<br />Kaliya is traditionally made with paneer or cottage cheese. This new variation of kaliya does sound and look good. Will surely try it out next time.<br />I would not mind sharing some fabulous traditional Indian recipes with you, if this one goes well with the readers.<br />Keep up the good work.